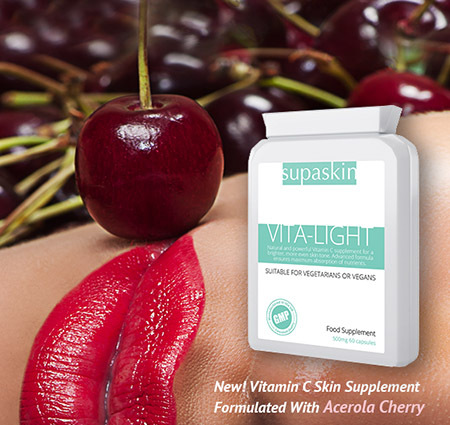 Vita-Light capsules are factory sealed in a special FLAT-PACK bottle for easy delivery. Our Food State Vitamin C complex combination is made up of natural food ingredients; as recognised and required by the body for maximum digestion, absorption and utilisation. Known as a Super Fruit due to it's exceptional nutritional values and very high natural source of Vitamin C. Vitamin C is essential for the growth and repair of cells and for a strong immune system. These little red coloured fruits possess an amazing array of vitamin and antioxidant power. Acerola cherry provide a naturally bio-available and powerful source of Vitamin C which is fully utilised by the body, unlike man-made ascorbic acid which is sold as vitamin C.
Researchers have identified nearly 150 nutritive constituents in acerola cherry which includes bioflavonoids, proteins, mineral salts, iron, calcium and phosphorus. As a comparison of Vitamin C content to other fruits, 1 small Acerola cherry contains around 80mg Vitamin C - this is 30 times the amount found in Oranges (of the same weight). This undoubtedly makes acerola cherry one of the most nutritious fruits known to us. Rosehip is excellent for pigmentation and scarring due to its natural healing properties containing vitamin c and vitamin a. From a health perspective, they are best known for their high content of vitamin C. There is approximately 1,700 mg of C in 100 gm of dried rosehip. That's a lot of readily bio-available vitamin. A lot more than what's in an orange. Native Americans have been using rosehips as tea for thousands of years and when the tea is finished, the hips were added to stews or soups. There was just too much nutrition in a rosehip to let it go to waste. This dark red fruit is certainly no stranger to the world of alternative medicine and could be described as a nutritional superstar with its high iron and vitamin content. It has an antioxidant potential even greater than that of blueberries. Parsley is a highly nutritious member of the umbelliferous vegetable family. It has many health benefits and has been used for 100's of years as a natural remedy for many conditions and as a food. It contains a host of nutrients such as Vitamin A, C, E, bioflavonoids, iron, folic acid, volatile oils, coumarins, flavonoids and chlorophyll. Parsley contains more vitamin C than any other culinary vegetables i.e. approximately three times as much as found in oranges and about the same amount as black currants. It's iron content is also high (around twice as much as spinach). The plant is a good source of manganese, calcium and potassium. Also acts as an antioxidant. Another Super Fruit due to it's wide array of beneficial phytonutrients. During World War 2, the blackcurrant was used as a replacement for oranges and other fruits rich in Vitamin C as they were hard to come by in the United Kingdom. Blackcurrant fruit is extraordinarily rich in Vitamin C and far superior to navel oranges - containing more than three times as much as an orange. It also contains a good amount of calcium, potassium, phosphorus, iron and vitamin E. Blackcurrants are a great food for increasing energy and the seeds are rich in unsaturated fatty acids. Packed with Antioxiants (anthocyanins, a type of polyphenol) and Phytonutrients, a recent scientific study has revealed that the natural chemicals and compounds found in blackcurrants may help balance the impact exercise can have on the body. A true gift from Nature. Elderberries contain more vitamin C than any other herb except for black currants and rosehips! Anthocyanins found in elderberries have more antioxidant capacity than either vitamin E or vitamin C.
Elderberry anthocyanins support immune function by boosting the production of cytokines, proteins acting as messengers in the immune system to help regulate immune response. They are rich in antioxidants, vitamins A, B, and C, flavonoids, and potassium. Also said to be good as healthy heart support. In Summary: The combination of vitamin rich ingredients in this product provide you with an exceptionally effective, food state vitamin C along with all of the healthy nutrients that ensure maximum absorption and nutritional utilisation as the array of nutrients work in perfect synergy within the human body. This will provide the most effective results to improve your skin tone. For this reason, Vita-Light is more effective than synthetic Vitamin C supplements. Most of these synthetic vitamin products are packed with unwanted fillers, binders, additives and colors. In many cases, these excipients can reduce absorption of the active ingredients and are potential allergens to many people. Vita-Light Vitamin C capsules are manufactured in the UK to Good Manufacturing code of practice and BS:EN 9001:2000 quality assurance certification. Only the finest quality raw materials in their highest and purest form are used. Good Manufacturing Practice provides independent verification and certification that the basic manufacturing practices and prerequisites necessary for product quality and safety are being followed. This goes above and beyond what is required, ensuring we can guarantee you receive a high quality product. Take 1 to 3 capsules per day with or without food or as advised.